>> Which Way Will You Enter Eternity? Which Way Will You Enter Eternity? Where are you going to be in the morning or in the next five minutes? None of us know the answer to that for sure. We may have plans, but the Lord may have other plans. 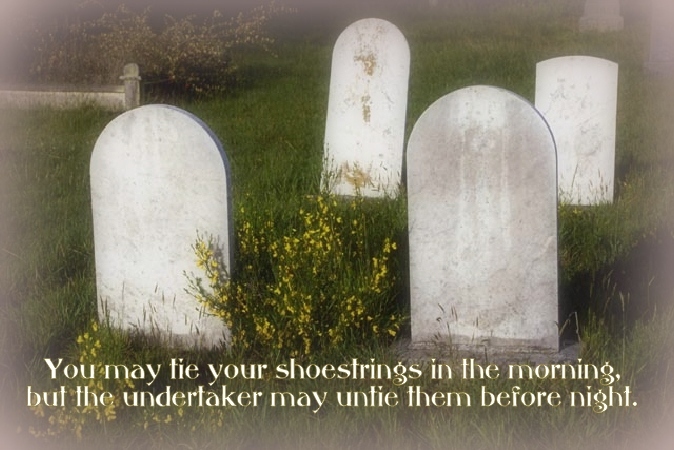 You may tie your shoestrings in the morning, but the undertaker may untie them before night. Which way are you going to enter eternity? That “It is appointed unto men once to die”? 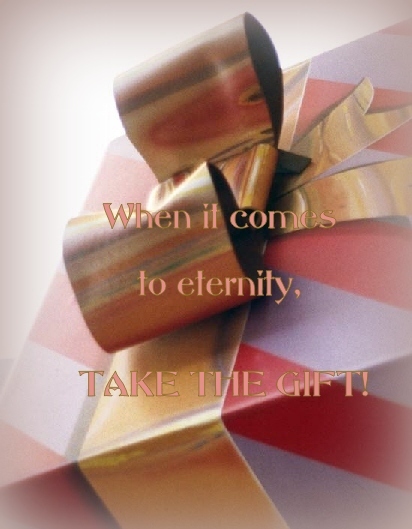 To spend your never-ending eternity? But lose it all when you go to the grave. Nor can it purchase salvation untold. You may have it now; trust Christ and live! Which way will you be ready for eternity? There is only one way to heaven, but there are two ways into eternity – saved or lost. What if you knew you were going to die today or what if the Dr. gave you a month to live? Are you ready to die? Here is a story of a man in prison who was sentenced to death. He knew he was going to die. Do you have Hope or Fear? Three years ago I was condemned to death for murder. You can imagine that my cell became a little hell. The thought of approaching death tortured me day and night. Only a few more weeks and I should be in eternity. I could neither eat nor sleep, so I decided to make a rope from my torn bedsheets with which to hang myself. Only the fear of eternity held me back as suicide would hasten my arrival there. One day I found a gospel tract which had been placed on my table. I scanned through the contents which I considered to be nonsense and threw it into the corner. Later, however, I picked it up again and read it through. Thinking over it I paced up and down in my cell, longing to be delivered from this fear. In the leaflet stood the words, “The Son of man is come to seek and to save that which was lost” (Luke 10:10). Lost! yes, surely, I was lost. But how could I be saved? How could I get rid of the heavy burden? I managed to get hold of a Bible and began to read it, still filled with this strange feeling swaying between hope and fear. Then I found the words, “The blood of Jesus Christ, God’s Son cleanseth us from all sin” (I John 1:7). Was that really possible? I fell on my knees and confessed my sins to God, and found forgiveness and peace. Later my death penalty was changed to life imprisonment, but I knew I had been given eternal life through Jesus Christ (Rom.6:23). Here is a story in the Bible of a man that was almost persuaded to be saved. Paul stands before King Agrippa. He is ALMOST persuaded to be a Christian, but almost does not count! Paul had been in prison for more than two years. Many spoke false things against Paul, but they could prove none of them. Festus, the governor asked Paul if he was willing to go up to Jerusalem and be judged concerning the things of which he was accused. 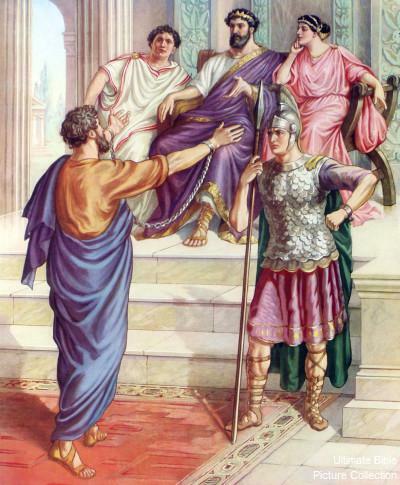 Paul requested to be sent to Caesar and being a Roman citizen, he had that right so Festus granted his request. About this time some distinguished visitors came to Caesarea to see the new Governor. They were Agrippa, the governor of the country east of the Jordan River, and Bernice, his sister. This Agrippa was sometimes called a king. During their visit Festus told them about Paul. He told them that the Jews were accusing him of breaking their religious laws and that in his trial before the Jews, Paul had spoken earnestly about one named Jesus, who had risen from the grave. Paul told Agrippa of his past life and how he persecuted those who believed in Jesus and put many of them in prison. He told the story of his trip to Damascus where he was going to persecute Christians. I was on my way to Damascus to persecute the Christians there when I saw a vision from God. It was at midday, O King, when suddenly I saw on the road a light from heaven, more dazzling than the noonday sun, and the brightness of it frightened me and my companions. We fell to the ground, then a voice spoke to me in the Hebrew language, saying, ‘Saul! Saul! why are you persecuting me?’ I cried, ‘Who are you, Lord?’ and the voice replied, ‘I am Jesus, whom you are persecuting.’ That voice commanded me to stand on my feet while I received Jesus’ orders. And that voice told me I should tell of Jesus, not only to the Jews, but to the Gentiles as well. Festus thought that Paul must be crazy and called out, Paul, much learning makes you mad. Don’t be like Agrippa who was almost persuaded for almost may turn into too late. You don’t have to be like Agrippa – almost, or so close, but too proud or too attached to other things that you won’t get saved. You can be saved to day. It is a free gift. You cannot earn it. Maybe there was a time when you trusted Christ, or thought you did, but sometimes you have doubts. Listen to this story. Her reply was, “I hope so.” I told her that if she had everlasting life, she should know it. “Everlasting life!” she shouted aloud. “I have everlasting life!” Oh, the blessedness of resting on the Word of God, and having confidence in it, because it is the Word of God. “These things have I written unto you that believe on the name of the Son of God; that ye may know that ye have eternal life” (1 John 5:13). Yes, we need to know for sure that we are saved so that we are ready for eternity, but once we are saved we also need to remember that the Lord says, behold, I come quickly. If you are a Christian, how are you living? Would you be ready for Jesus to come today? Are you ready to stand before Him and give account for your life?